edit: The option described below has been removed from Chrome. This should void the question as well as my answer. Google has buried this option in a very hard-to-find location. I would make a comment instead of a new answer but I require 50 rep for that. 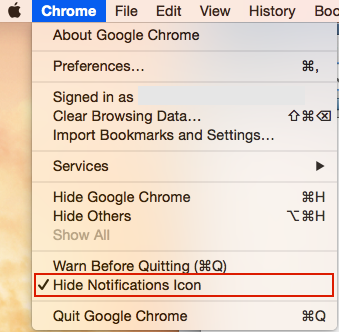 It seems like Google Chrome after v 47.0.2526.73 no longer has the Notification center (bell). It worked for me by simply locating the file (mine was in the download folder) and deleting it. The key is to locate the incomplete file. Some solutions here appear to be outdated. For Chrome (Version 35.0.1916.114), all you have to do is click on the bell to open the dialog box and then simply click on the bell with the line through it to toggle it on and off. It disables the notifications, but doesn't remove the bell, so it solves part of the problem, that you said there was "no easy way to disable it". Not the answer you're looking for? Browse other questions tagged google-chrome menu-bar . How can I get rid of this icon in my menu bar? Can I hide the sync icon in the menu bar on Lion? How to get rid of a second CrashPlan icon in the menu bar? How do I remove the strip above my menu bar? What is the icon next to Spotlight in menu bar, and how to remove it?